Are you a bathroom singer? Are you hiding a hidden talent? Are you a singer, dancer, trickster, joker & etc.? What are you waiting for? 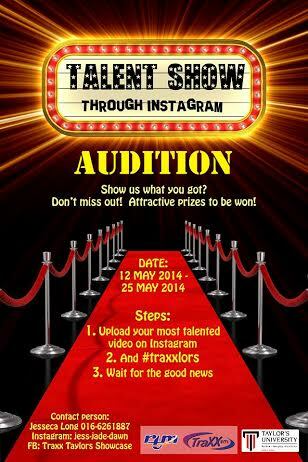 Record an Instavideo of you doing what you do best, hashtag #traxxlors , and you will stand a chance to be a part of Traxx.fm Taylor’s Showcase on June 11th! Great prizes to be won! What’s more? You’ll stand a chance to perform on air! We’re talking radio and TV exposure, guys. Start sharpening those talents, start recording, and start sharing! Previous post ← Poetry: THE WORDS A MOTHER WANTS TO HEAR.